1. Can the Matrice 100 support two batteries? What’s the maximum flight time? The dual battery compartment on the Matrice 100 can hold a second TB48D battery. When flying with a dual battery supply, you must first start the battery connected to the MC before starting the second battery. Make sure both XT60 power plugs are plugged in. If you don’t need a second battery, make sure to unplug the XT60 plug of the spare battery compartment to avoid short circuiting. 2. Is the Matrice 100 GPS the same as the A2 GPS? The GPS on the Matrice 100 is the GPS PRO PLUS, which is compatible with the A2 GPS. However, we do not recommend using the A2 GPS PRO. The GPS PRO PLUS greatly improves anti-interference, satellite acquisition and positioning accuracy performance. 3. Can I mount the battery compartment to the upper center plate? Yes. Users have the option of mounting the battery compartment onto the lower center plate or the upper center plate. During installation, please make sure the battery terminal faces the aircraft tail direction and use four M2.5X5 screws to mount it onto the extension bar. Also make sure to mount the battery compartment to a position on the extension bar that allows the center of gravity to be adjusted properly. Note the hole on the upper plate reserved for wiring and make sure the extension rod, ESC, etc. do not damage the cables. 4. How do I connect the gimbal cables? 1. Insert one end of the 10-pin gimbal cable into the 10-pin port of the flight controller, and the 8-pin gimbal cable into the 8-pin port. 2. Insert the other end of the 10-pin gimbal cable into the 10-pin port of the gimbal clamp, and the other end of the 8-pin gimbal cable into the 8-pin port. 5. How do I ensure a 3 degree tilt while attaching the Matrice 100 arms? Are any special fixtures needed? 6. What are the definitions for the CAN1 port and the UART port? On the two sides of center frame, there is 1 GPS CAN port, 2 CAN1 ports（5 pin）and 2 UART ports（6 pin）for connecting other devices (while connecting devices to the following 2 power ports, pay attention to the voltage to avoid damage to peripheral devices. Meanwhile, do not connect other charging devices to the power port in case it short circuits inside the flight controller). 7. Can we use master and slave remote controllers on the Matrice 100? 1. Does the Matrice 100 have no-fly zones? Can I override a no-fly zone? The Matrice 100 is pre-set to comply with airport restrictions, no-fly zones and other special flight restrictions. You can refer to the DJI official website for more details about global flight restriction areas (http://flysafe.dji.com/no-fly). You cannot override the no-fly zones. 2. Can I use the DJI GO app to perform all Inspire 1 functions without using the SDK? Yes, except the functions related to the intelligent landing gear. 3. Which parameters can be adjusted through the DJI Assistant software? The DJI Assistant software can perform firmware upgrades, configure SDK settings, and more. 4. How far will the visual positioning system keep the aircraft away from obstacles? Can this parameter be changed? The obstacle avoidance distance can be divided into perceptive obstacle distance and brake distance. Guidance has a formula to calculate the perceptive obstacle distance according to the current flight speed of the drone. The maximum brake distance can be adjusted in the Assistant Software. 5. What difference (such as flight speed) can the obstacle avoidance function make? Before the obstacle avoidance function is enabled, the flight performance of the Matrice 100 is the same as that of the Inspire 1. When this function is on, the Matrice 100 can achieve a maximum flight speed of up to 7 m/s and the velocity is adjustable. 1. Are the H4-3d and H3-3d gimbals compatible with the Matrice 100? Not completely. The Matrice 100 uses the Inspire 1 gimbal camera. Since the communication protocols are different (the Inspire 1 uses a USB link whereas the H4-3D and H3-3D use CAN links), the H4-3D and H3-3D are be not perfectly supported. If you use an N1 Video Encoder with a GoPro camera, you can connect the GoPro’s CVBS (AV) port to the N1 Video Encoder, and then transmit the images by HDMI or DJI GO. 2. What propulsion system is used on the Matrice 100? Is the E800 propulsion system compatible with the Matrice 100? Since the Matrice 100 uses a custom-built E800 propulsion system, separately purchased E800 propulsion systems cannot be installed directly onto the Matrice 100. 1. The power and signal ports are different and not compatible. 2. The software and hardware are different. 3. What are the current and voltage output characteristics of the XT30 port and the XT60 port? Note: the total current for all the reserved XT60 ports and XT30 ports cannot exceed 10A. 4. Can we connect other accessories to Matrice 100? There are 5 extension ports on both sides of the center frame for users to connect their devices. The five ports are the XT30, XT60, GPS CAN, CAN1, and UART ports. 5. Can Guidance be used with other DJI flight controllers or a third party controller? Currently, Guidance only supports the N1 flight controller. 1. What is included in the box with the Matrice 100? 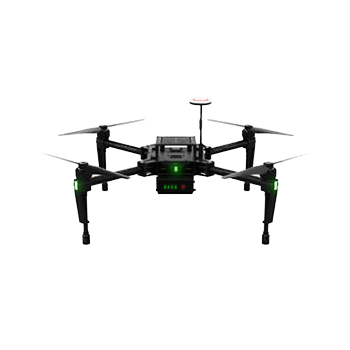 The Matrice 100 comes with a center frame, remote controller, battery, battery charger, GPS, extension frame accessory pack, and propellers in the box. You will need to purchase the Guidance, Guidance installation fittings, gimbal accessories, and a gimbal separately. 2. What flight controller is used with the Matrice 100? The Matrice 100 uses the N1 flight controller. 3. What’s the maximum communication distance of the Matrice 100’s remote controller and how does it transmit images? The remote controller integrates video downlink and aircraft control into one system. The combined system operates at 2.4GHz with a maximum signal transmission range of 5 km. 4. Is the Matrice 100 gimbal similar to the Inspire 1 gimbal? The Matrice 100 uses the DJI Zenmuse X3 gimbal, which is the same as the Inspire 1 gimbal. 5. What’s the Matrice 100’s battery capacity and flight time? Can I use the Inspire 1 battery on the Matrice 100? The battery capacity is 4500mAh and the battery voltage is 22.2V. The hovering time can reach up to 25 mins. The Inspire 1 battery is not compatible with the Matrice 100 battery because of the structural difference of the battery clamp. 6. Does the Matrice 100 have a damping function? If so, how much impact can it support? The Matrice 100’s landing gear have a damping function. They can support the impact force of an aircraft with a 3.0 kg takeoff weight that lands at a speed of 1 m/s. 7. What’s the default takeoff height of the Matrice 100? 8. What’s the maximum altitude for Ready-to-Fly mode? The maximum altitude is 3000 m.
9. What are the functional differences between the Inspire 1 and the Matrice 100? The functions are basically the same. However, compared to the Inspire 1, the Matrice 100 provides greater expandability.